This article first appeared on East Niagara Post on December 30, 2014. It is repeated here as I work to put all my book reviews in one place. They will be posted on Thursdays or Fridays and only be altered from the original in that I will add publisher information and pages. Hopefully, by revisiting these reviews, other people might find a book they'd like to pick up for their own enjoyment. When I first started writing reviews for East Niagara Post, I told myself I would not repeat authors, at least right away. It only took three months to break that promise to myself. In my defense, the author I am reviewing today is well worthy of a second review, especially if you like character-driven novels that echo real life rather than glamorous life. 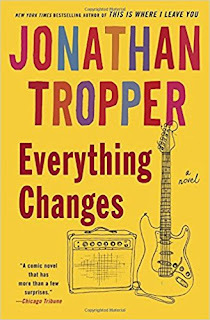 In my opinion, Jonathan Tropper is that worthy author. Previously, I had reviewed The Book of Joe. Today, I turn my attention to another of his works, Everything Changes. In Everything Changes, 32-year old Zachary King is ready to tie the knot with his rich girlfriend. He has it all, a beautiful woman, a rent-free apartment in Manhattan with his independently wealthy roommate, and a steady job. Which, in Tropper’s universe, means that all hell is about to break loose in King’s life. Just like in real life, nothing is ever as simple as it appears. The crux of King’s issues is that he has fallen in love with his best friend’s widow and sees himself as a surrogate father for their child. In the two years since his best friend’s death, he has taken the time to make sure that he visits Tamara to let her know she is not alone and still has him as a friend. Part of him may feel guilty because Zack survived the same crash that killed Rael. In the midst of all these mixed feelings as he head towards his nuptials, his estranged father arrives to intrude on his seemingly idyllic life. He brings mayhem into Zack’s life and makes the younger King question all his own decisions. Just when it seems like there can be nothing else to go wrong, a health issue brings his own mortality to the forefront. In the following scenes of Zach attempting to come to terms with where his life has landed, hilarity ensues. With his father around, no one knows exactly how things will turn out. This is the man, who while cheating on his wife, was photographed in the act by his wife. She then used the photo on the family’s Christmas cards. As traumatic as that may seem, imagine how that impacted a teenage Zack. Twenty years later, people still remember that photo of Norm King on their Christmas card and remind Zack of that fact. Norm’s reappearance into Zack’s life causes no end to consternation faced by the younger King. When Zack faces a medical issue that leaves him sleepless at night wondering whether the diagnosis means cancer or sterility, or something completely benign, his father drags him along an adventure to find his doctor somewhere on the golf course. It is pure comedy as Norm, Zack and his roommate attempt to avoid country club security while racing after an elusive, golfing doctor. Lucky for Zack, the news is good. Unlucky for Zack, his father invites himself to Zack’s rehearsal dinner. Zack is initially concerned that Norm will embarrass him with his fiance's well-off parents and siblings. Somehow, despite all his shortcomings, Norm is able to schmooze his way to the good side of the family. However, it is Zack who causes his own issues when he is caught kissing Tamara by his future father-in-law. In true Tropper fashion, nothing's quite as simple after he leaves his fiance’s family home. He’s lost his girlfriend while the woman for whom he has buried feelings suddenly states that she needs some time to think about what has transpired. At least he still has Norm to keep him on his toes. Norm reiterates that the happiest man is the man who doesn’t do something simply because it is the comfortable thing to do, but does something that makes him feel good. Perhaps he was in the wrong relationship all along, Norm quips. Now it is up to Zack to determine which path to blaze. Will Zack make the correct decision? Will he find his way back to his girlfriend? Will he find a way to gain Tamara’s trust once again and become a father to her young daughter? Will he keep Norm in his life? These questions and more will be answered by the time you turn the final page of Everything Changes. Once again, Jonathan Tropper delivers a hilarious, heartfelt narrative on the pitfalls of being human, especially a socially flawed human. He reminds us that the choices we make affect more than just ourselves. We must be honest with ourselves in order. It’s the only way to form and nurture the relationships around us. 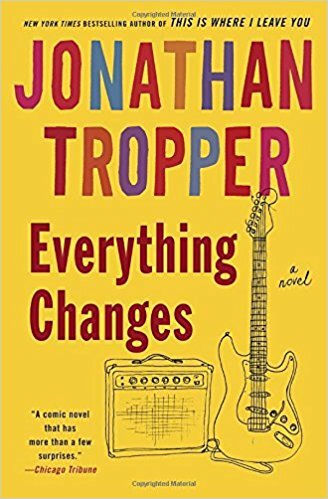 I have thoroughly enjoyed all the Tropper books that I’ve read so far. His fast, easy pace keeps the reader engaged and eager to discover the fortunes of all the characters. LIke in his other books, his protagonist is his own worst enemy. I’m sure we’ve all made those choices where when we look back on it, we wonder what the heck were we thinking? And we’ve all had friends who we’ve questioned about their own ill-fated decisions. Jonathan Tropper throws it right in our faces. And he makes us laugh about it, while we think (mostly to ourselves, because we really don’t like to admit it) that it could easily be us making the same mistakes. As I stated at the beginning of this review, I really tried to avoid writing reviews of the same author, especially so close together in time. Of course, as I was finishing this review, I actually finished another Tropper book, How to Talk to a Widower. That book is even better than this one, however, I will not be reviewing it at this point. In a side note, I just purchased the movie, “This is Where I Leave You.” This movie is based on Jonathan Tropper’s book of the same name. It was that book that started me on this author’s works. I hope to watch the movie over Christmas break. Maybe I could invite another East Niagara Post columnist over to watch it, and then he could write one of his fabulous reviews. I cannot adequately explain how much I enjoy this author’s works. I eagerly await his next new novel, hopefully sometime in the next year or so. Craig Bacon can't wait for the next Jonathan Tropper book. He hopes it comes soon.